In a 2017 post on this site, Christof Heyns and Willem Gravett proposed the idea of external sessions for the UN Human Rights Treaty Bodies – they should meet at least once a year for part of the session outside Geneva, in order to ‘bring the system closer to the people’. This idea generated considerable interest, including in the recent report by the Geneva Academy of International Humanitarian Law and Human Rights, Optimising the UN Human rights treaty bodies system. At the same time, the practicalities of such a system remain uncertain. Very little academic research has also been done on the topic. There is a wealth of experience with such a system in the African and the Inter-American human rights systems. The contexts and practices differ between the regional and the United Nations mechanisms: if a roving system is implemented at the UN level, the treaty bodies would for example probably meet at UN regional offices as opposed to do so as the guest of a host State. However, much may still be learned from the regional experience. We have asked members of these two systems to share some of their experiences. Here we publish the response from within the African system. The Inter-American experience will be next. The African Commission on Human and Peoples’ Rights (the Commission) was created by the African Charter on Human and Peoples’ Rights (African Charter). The Commission is today supplemented in it function to monitor State compliance with the Charter by the African Court on Human and Peoples’ Rights. The Commission was established in 1987 and has thus been exercising its mandate on the continent for the past thirty years. Its methods of work include the consideration of State reports on implementation on the Charter by State Parties, as well as the consideration of individual communications. 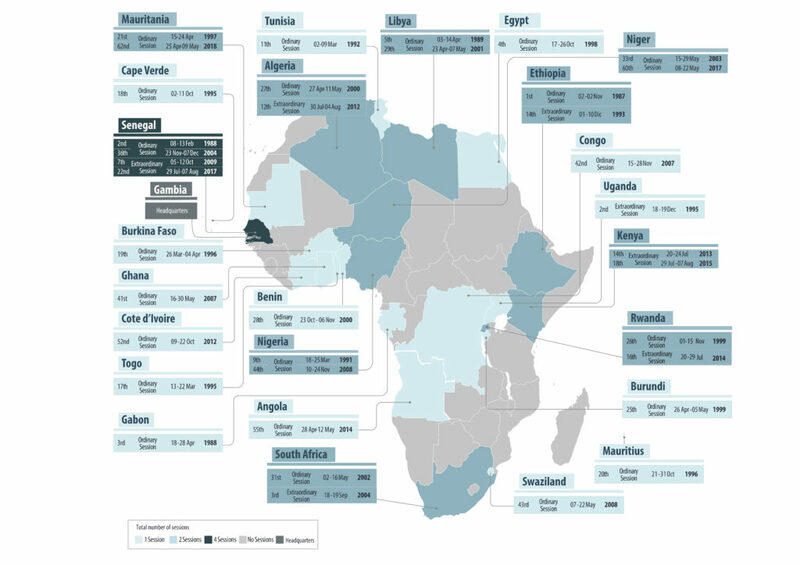 All African States except the newest, South Sudan, are State parties. The Commission consists of eleven members, who meet twice a year in Ordinary Sessions. While this happened more rarely in the past, two Extra-Ordinary Sessions are these days convened per annum. The Commission is serviced by a full-time Secretariat, which is headquartered in Banjul, The Gambia. 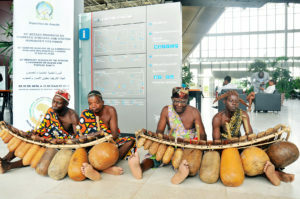 The African Union (AU) provides the Commission with the financial resources to discharge its mandate. The Sessions of the Commission are conducted in all AU Official Languages, being English, French, Portuguese and Arabic, with simultaneous interpretation as required. When the Commission meets in Ordinary Sessions, it conducts its business in both public and private sessions. 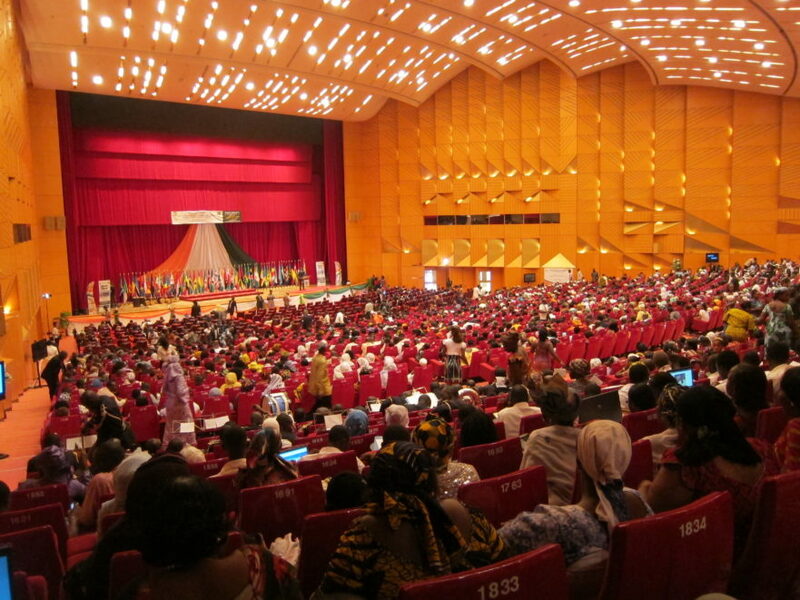 The public sessions are open to the public, and are usually attended by a wide range of stakeholders, including State Parties to the Charter, Organs of the AU with human rights/human rights related mandates, International Organisations, the continent’s National Human Rights Institutions, Non-Governmental Organisations (NGOs) and other civil society actors, members of the Press and other observers. On average, over four hundred individual participants attend each Ordinary Session of the Commission. In line with the Charter and the Commissions’ Rules of Procedure and established practices, the public sessions of the Commission have standing agenda items on the following issues: The human rights situation on the continent in general; the consideration of State reports submitted on the implementation of the Charter; the inter-session activities of the members of the Commission and its special mechanisms; and the relationship and cooperation of the Commission with NHRIs and NGOs. Other public session activities include: panel discussions on thematic issues, launch of soft law instruments and stakeholders’ consultations. The public sessions of the Commission are preceded by a forum of NGOs (NGO Forum), who submit their findings and recommendations to the Commission. Different NGOs and other human rights organisations also convene side events in which various Commissioners and staff participate. Extra-ordinary Sessions are purely internal meetings of the Commission and thus do not have any public component. The Charter provides that its meetings shall be convened by its Chairperson whenever necessary, but at least once a year. Rule 28 of its Rules of Procedure of 2010 are to the effect that its Sessions shall be held at the Commission’s headquarters, or in the territory of any other State Party to the Charter which invites the Commission, or at the headquarters of the AU. For a Session of the Commission to be convened at the headquarters of the AU, there must be prior consultation with the Chairperson of the AU Commission (AUC), as well as an agreement on the sharing of costs for such a session. Only two Sessions of the Commission have thus far taken place at the AU Headquarters in Addis-Ababa, Ethiopia, and this option will thus be left out in the subsequent discussion. On average one Ordinary Session per year is normally held in the Gambia and one in another State party, though this is not a fixed pattern. Of the 62 Ordinary Sessions which the Commission has thus far convened, a total of 33 have taken place in The Gambia. A total of 29 Sessions have taken place in other countries on the continent, and can thus be described a ‘roving’ sessions. To date, eight of the 23 Extra-ordinary Sessions convened were held outside The Gambia (See Figure 1). The recent pattern is to hold at least one Extra-ordinary Session per year outside of the Commission headquarters. Figure 1. Map showing the Commission’s Sessions held outside The Gambia. When Sessions are held at the Commission’s headquarters, the Gambian Government covers those elements that fall within their agreement as the host of the Commission’s Headquarters, while the Commission covers all other costs related to the Session from its AU-funded budget. Elements covered by the Gambian Government include visa facilitation for participants, protocol services, transportation and security personnel for State delegates and Commissioners, office equipment for the Session, media coverage, and a reception for participants. Costs covered by the Commission include the rental of the venue, the costs of interpretation and interpretation equipment, translation costs and other core meeting requirements. Offers to host Sessions of the Commission are usually made by interested States during their interventions in public sessions of the Commission. However, offers can also be solicited by the Commission during promotion missions, summits of the AU and other engagements between members of the Commission and State Parties. Offers are taken up in the order in which they have been received, and are followed up by the Secretariat through a detailed engagement with the State, culminating in the signing of a largely standardised hosting agreement. In terms of the hosting agreement, the State agrees to take on “all additional expenses incurred by the Commission as a result of the Session being held outside its headquarters” including the financial implications of moving the Secretariat of the Commission to the relevant State and those relating to the venue of the Session and meeting facilities. This include the provision of air tickets, accommodation, daily subsistence allowance, insurance cover and ground transportation to all Staff of the Secretariat servicing the Session as well as the provision of required equipment, office supplies, coordination focal points and local support staff for the Session. To qualify as a host State for the Sessions of the Commission, the Rules provide that such a State must not be under any suspension of the AU; respect the provisions of Article 62 of the African Charter; and comply with all the recommendations of the African Commission. However, these requirements have not in practice had much of an impact on preventing States from hosting the Commission. It should be noted, however, that while the requirements set in Rule 28 for States wishing to host the Commission refer to “Sessions” in general, the Rule is in practice only applied to Ordinary Sessions of the Commission, which have a public component. For Extra-ordinary Sessions, which do not have such a component, the Commission does not wait for or request an invitation from a State; rather, it informs the State once a decision has been taken by the Commission to hold an Extra-ordinary Session in that State. These notifications are routinely acknowledged by such States, who do not have any financial obligations towards the Extra-Ordinary Sessions, as these are wholly covered by the Commission, although the States are invited to extend any courtesies they would wish to. The idea of posing some conditions for States to host the treaty bodies may be interesting from the UN perspective, though if the UN regional offices are going to host the Sessions this may be less of a factor. 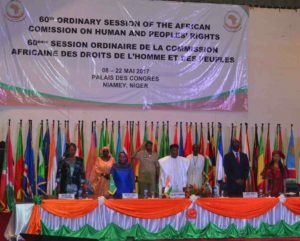 The Rules also anticipate that Sessions of the Commission could be held jointly, in collaboration with other human rights bodies of the AU, namely the African Court on Human and Peoples’ Rights (the African Court), the Committee of Experts on the Rights and Welfare of the Child (the Children’s Committee), or any other African regional human rights organ. A joint Session was held in October 2016 by the Commission and the Children’s Rights Committee in commemoration of the year 2016 as the “African Year of Human Rights, with particular reference to the Rights of Women”. Presumably, it will also in principle be possible to hold parallel sessions with UN treaty bodies, particularly in light of the mandate of the Commission to cooperate with other African and international institutions concerned with the promotion and protection of human and peoples’ rights. It is also noted in this regard that the African Committee of Experts on the Rights and Welfare of the Child has a corresponding provision in its Rules or Procedure on the possibility of hosting joint sessions, as well as provisions for the mobility of its Sessions under terms and conditions similar to those of the Commission, pursuant to which it has held a number of sessions outside of its headquarters in Addis-Ababa, Ethiopia. The African Court on Human and Peoples’ Rights also has provisions in its Rules of Procedure for the mobility of its Sessions, and has held some of its Sessions in countries other than its headquarters in Arusha, Tanzania. The first benefit of the system mentioned earlier is an increase in the visibility of the Commission. The preparations for a Session and the related interaction increases knowledge within the organising government about the Commission, and participation in the Sessions are often at the highest levels of Government – usually at the level of the Foreign Minister, but sometimes at the level of the President of the Country. The Session also provides the opportunity to many of the nationals of the hosting State to attend a Session, which would otherwise not have been possible. 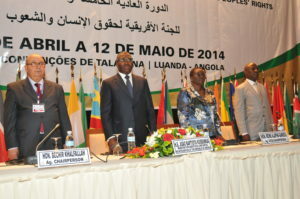 Also, given the relative difficulty and high cost of traveling between African countries, moving the Sessions of the Commission around the different sub-regions of the continent facilitate the attendance of stakeholders from the different sub-regions at Sessions held within their sub-region because it is easier to travel within the sub-region. The visibility of the Commission is normally quite high when it sits in a foreign city. Banners are as a matter of course put up in the streets for the duration of the Session, welcoming the Commission to the city. While the work of the Commission normally attracts little attention in the host country, it is different when they travel. Media coverage of Sessions outside The Gambia is often quite extensive and clips of the public Sessions, interviews, documentaries and other activities on the work of the Commission are shown on local television and or radio stations. A second positive consequence for non-State stakeholders is that a platform is provided by the Session which brings together a wide range of human rights actors and provides an opportunity to sensitise, mobilise, create or strengthen networks of human rights actors in the hosting countries or sub-regions. The NGO Forum which precedes the Commission’s Sessions also offers an opportunity for visibility, sensitisation, networking and capacity-building for local NGOs in the hosting States. Another positive consequence is that NGOs of the hosting State can bring concerns specific to that State to the attention of the Commission and other stakeholders. In some cases there are attempts by some governments to prevent them from doing so, but that is difficult because the Commission is a formal AU body. If the UN is going to consider doing roving sessions, it may be useful for the relevant UN treaty bodies that do not have such a practice, to introduce a session where NGOs and other stakeholders can address them. On the part of the States, they are also afforded the opportunity during the Sessions to showcase the progress made in the protection and promotion of human rights in their territory, while the Commission also gets a better understanding of the challenges and realities facing the host State. An opportunity presented in this regard, but rarely used, is for the Commission or its special mechanisms to undertake some assessment visits while on ground, such as to the prisons, and to meet with local NGOs and other similar human rights actors. Notably, however, NGOs have sometimes taken the opportunity during Sessions to do assessment visits, or undertake other forms of assessment of the human rights situation in the country. The Commission has also taken the opportunity of its Session time to visit human rights memorial sites on few occasions. This is an important way in which local memorialisation of human rights violations is given a broader audience and impact. 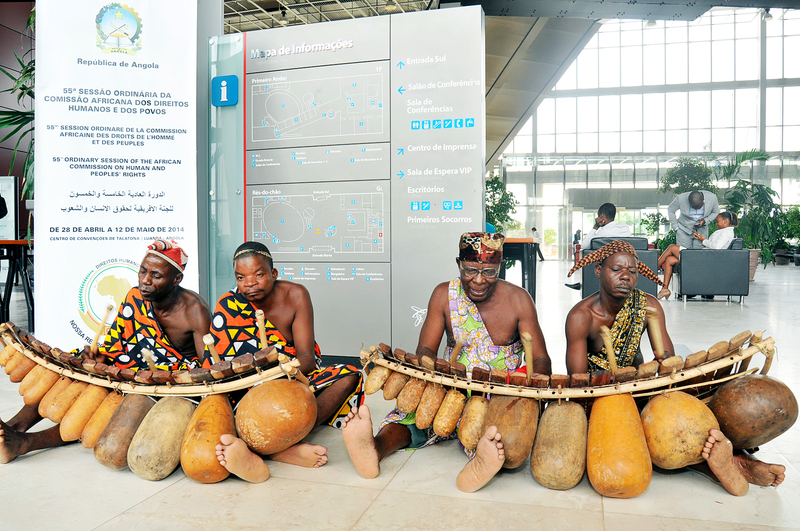 Lastly, mobility of the Sessions also serves to boost intra-African knowledge, tourism and travel, as participants become more aware of the rest of the continent and the facilities available in the hosting States. Our experience has been exceptionally beneficial – both substantively and procedurally. The process to host the Session of the Committee gives an opportunity to the hosting State to learn, and often champion the work of the Committee within the various political organs of the African Union. These Sessions have always created an opportunity for the Committee to engage with the host State, CSOs, NHRIs, and equally importantly children on issues covered by the Charter. In a way, it is one manner in which the Committee has been able to take the Charter to the main stakeholders. The mobility of Sessions is not without its challenges. The first is that hosting a Session has significant financial implications for hosting States. These can, however, be weighed against the immediate and long-term economic and other benefits that may be derived by various sectors of the economy from hosting the Sessions and being associated with human rights. It should also be noted that this will not be the case if the UN regional offices host the treaty bodies from that system. Secondly, external Sessions require a lot more preparation than Sessions held at the headquarters by the Secretariat and the Commission. For instance, as earlier indicated, a pre-mission must for example be conducted by the Secretariat of the Commission before a Session takes place. It also has greater preparatory challenges for other stakeholders who organise side events such as the NGO forum. These have cost and time implications, amongst others. Also, participants, especially NGOs who operate on lower budgets, often find it more expensive to travel to or cover the costs of sustenance during the Session in some host countries. Thirdly, despite the pre-missions and other preparatory efforts usually undertaken to facilitate a successful external Session, there is still the possibility of hosting States being actually unable to meet some of the agreed requirements, or as timely or as qualitatively as required, due to a number of factors including resource constraints, administrative bottle-necks and technological challenges, among others, which may then hamper the effective functioning of the Secretariat and/or impact negatively on the Session experience of the participants. 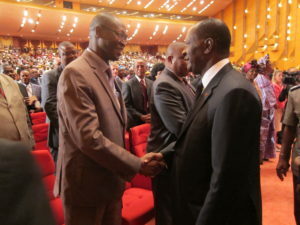 In some instances host States have cancelled at the last minute, or did not confirm till very late, and the Session had to be relocated to the The Gambia. In addition to the above, staff also face extra challenges of travelling and operating in an unfamiliar environment, which places additional pressure on them. Another challenge regarding external Sessions is that despite hosting agreements and efforts to ensure ease of entry into the hosting State for participants, challenges are still faced in some cases regarding obtaining entry visas, or gaining access to the venues of the Session. This contrasts with the situation in The Gambia, which is used to routinely aiding the Commission in this regard. In conclusion, the main challenges in the mobility of the Commission, particularly logistical challenges, are borne by the Secretariat of the Commission, but these challenges may additionally impact other participants in the Session. However, these costs must be weighed up against the benefits of having the Session take place in different locations. It is clear from the Commission’s practice over many years that it considers these inconveniences to be well worth coping with, in the interest of securing the better protection of human rights on the vast continent of Africa, through taking the system closer to where people live their lives. 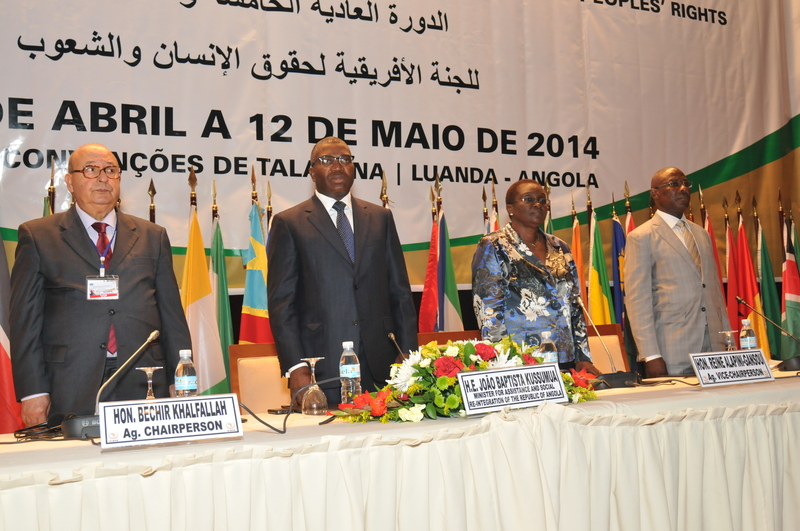 See the Final Communiqués and Activity Reports of the Commission at www.achpr.org. These meeting invariably take place in a hotel, as the buildings which have temporarily housed the Commission’s headquarters do not have the required conferencing facilities. Usually, sstaff of the Secretariat attend a Session on the basis of functions. On the average, between 20 to 25 staff members attend Sessions outside the headquarters. Costs relating to Commissioners are already budgeted and remain covered by the AU budget. 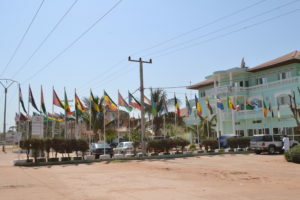 In addition, the host State is required to provide security for the Commission, its staff and all participants; protocol services for Commissioners, participating State delegates, Secretariat staff and other participants; medical services to Commissioners and Secretariat staff; as well as providing the relevant visas facilitation, privileges and immunities for participants. See Rules 28 and 29 of the Committee’s Rules of Procedure at www.acerwc.org. For instance, its last two Sessions, its 30th and 31st Ordinary Sessions, were held in Khartoum, Sudan, and Bamako, Mali, respectively. They have also met earlier in Lesotho, The Gambia, Algeria, and Kenya. See Rule 16 of the Court’s Rules of Procedures at www.african-court.org. For instance, its 35th Ordinary Session was held in Addis Ababa, Ethiopia in November 2014, and its 51st Ordinary Session is planned to be held in Tunis, Tunisia, in December 2018. This was for instance the case with the 41st and 52nd Ordinary Sessions, respectively held in Accra Ghana in May 2007 and in Yamoussoukro Côté d’Ivoire, in October 2012. Regrettably, the Commission does not have any official public relations strategy or personnel, and has thus been unable to maximize or institutionalize these opportunities. However, it did recently live-stream its 61st Ordinary Session. Such an assessment visit was for instance undertaken by the Commission to some prisons in Angola during its 55th Ordinary Session in May 2014. However, the Sessions are often very busy for the Commission and staff, and beside its usually heavy agenda, most stakeholders take the opportunity to meet with Commissioners; thus, not always allowing for time for such assessment visits. For example during the visit by the Commission to the Rwandan Genocide Memorial Sites during its 16th Extra-Ordinary Session in July 2014.